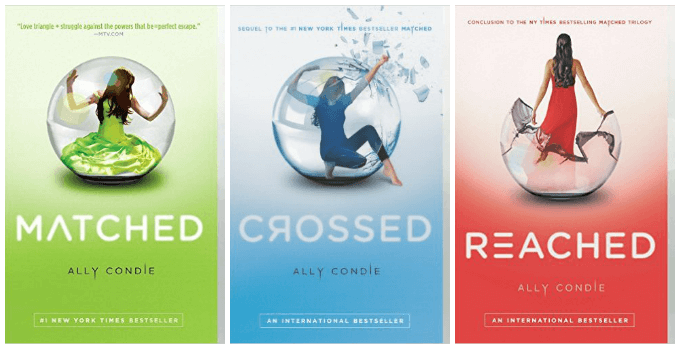 These are 30 of the best young adult books for anyone who loved Divergent or someone who just needs something entertaining to read! Definitely the best books like Divergent or at least great books similar to Divergent! I’ll just admit it right now, I’m a sucker for young adult lit, especially dystopian young adult lit that includes a good love story. I used to read a ton before I had my son two years ago. I think I read the entire Hunger Games series in probably three days, but that’s another story. And then I took a three year break from reading all together. When I had a few days all to myself for my Southern Living trip, I finally read the Divergent series and fell in love with reading all over again. I may have loved it so much that I made a taxi come pick me up at my hotel and wait at Walmart while I ran inside to buy book 2 and 3. Just maybe. I’ve been scouring the internet, GoodReads, Amazon, and even my friends to find the best YA books out there and you guys, I found some amazing ones. While not all of these are actually dystopian young adult novels, they’re all young adult novels and they’re all awesome. I’ve included links to Amazon (my affiliate links) for all of these books if you click on the book name under the description so you can check out other reviews as well. Oh and if you haven’t read the Divergent series or Hunger Games series yet, I have no idea what you’re waiting for. I’m just assuming if you’re reading this post that you’ve read both of those since they tend to be the most well known. 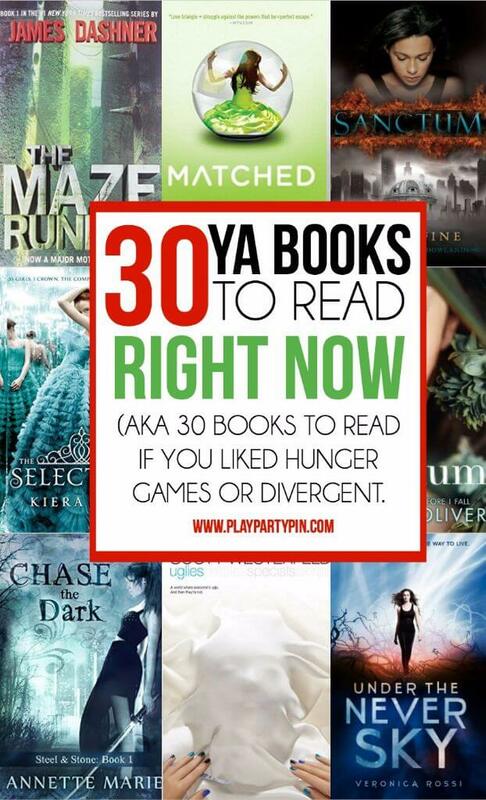 I went more for books similar to Divergent than Hunger Games, but if you liked Hunger Games, you’ll probably find something you love on this list of books like Divergent as well! I’m starting here because out of all of the books that I’ve read since Divergent, this series was my favorite. It’s similar in plot to others I’ve read. The main girl Lena runs away from being cured (basically made emotionless) and the invalids (the uncureds) fight a battle to right things again. But there was just something about this book that hooked me from the very beginning and kept me reading through all three books. 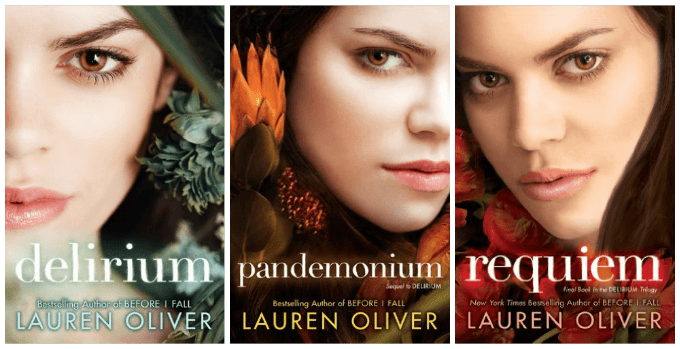 The three books include Delirium, Pandemonium, and Requiem and I really couldn’t tell you which one was my favorite. 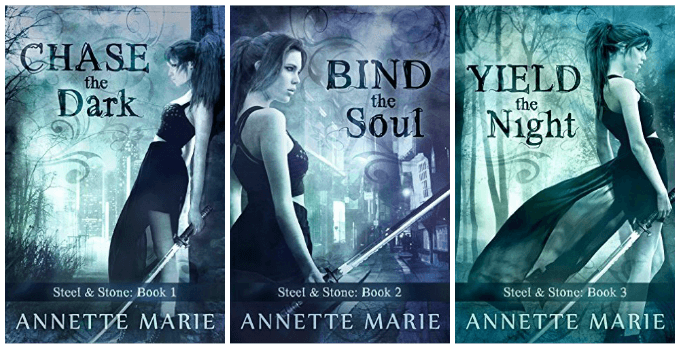 There’s a reason all three books have at least 4.5 stars on Amazon across the board. The Bachelor meets young adult lit, but in a much better and more entertaining way than the actual show. I wrote a full review of The Selection earlier this year and the rest of the books were just as entertaining. If you need any more proof, I gave my little sister the books while she was here for our great purge earlier this year and she literally didn’t sleep for three nights straight so she could finish The Selection, The Elite, and The One. I also included her 4th book but be warned, it’s actually about America’s daughter, not America herself. 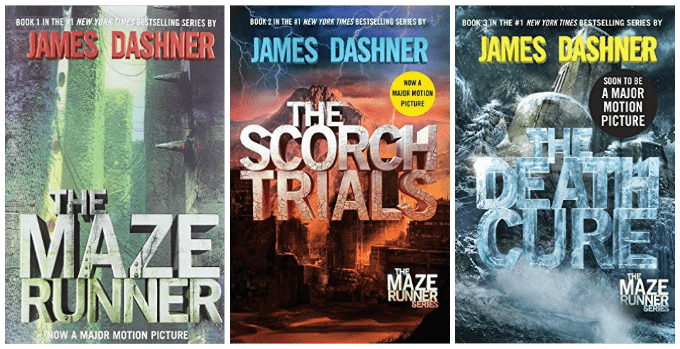 I really enjoyed this series, but I more enjoyed the first books more than the last one, mostly because I liked the main character of the first books more than the last one. The basic idea is similar to Delirium in that on your 16th birthday you are made pretty and until then you’re ugly. But what happens when people don’t want to be pretty? Definitely an intriguing idea and the twists and turns this one takes are great. Okay, I have to confess. I haven’t actually read this series yet, BUT it’s been on my list forever because it just sounds so good. I loved the “game” parts of Hunger Games, so I’m sure I’ll love this series. And with almost 7,000 4.5+ stars on Amazon, other people think it’s great too. I love, love, loved this series. It was one of the first things that I read after Divergent so it had a lot to live up to, and it did. A savage (someone that lives in the wild) and Dweller (lives in a futuristic city) have to come together to try to save both of their worlds from being destroyed. Sounds cliche, but I loved the characters and loved all of the twists and turns. In this book Lela’s friend Nadia kills herself and ends up inside the suicide gates. Lela feels responsible and goes in to get her out. It sounds dark, but it’s really not. Inside Lela realizes that getting into the city, finding Nadia, and getting out are not quite so easy. 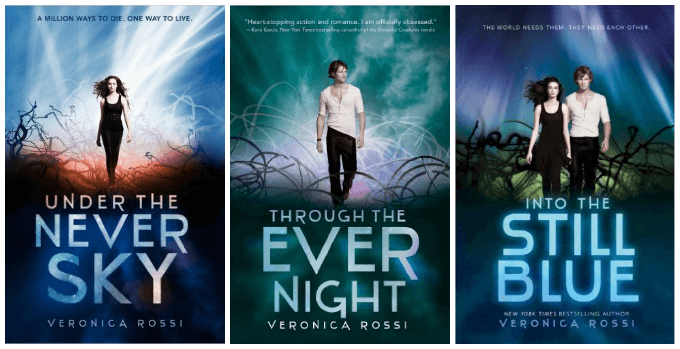 There are three books in this series and I really enjoyed all three of them, which doesn’t happen that often. I liked Lela (hated Nadia) and liked the people that Lela met while she was there. It’s different than the dystopian novels I’ve mentioned above and definitely worth reading. It’s almost available for free with Kindle Unlimited, so that’s a plus! In this book Piper is trying really hard to become a consul, a keeper of the peace even though all of the odds are stacked against her. She thinks she is finally getting her chance to prove herself but in reality her dad (the ultimate keeper of the peace) just wants to keep her away from everything. That night everything changes and Piper has to lean on some pretty scary (albeit attractive) guys to try and keep the peace. I didn’t love Piper as much as I’ve loved other strong heroines, but I really liked the two guys, so that made up for it. This one is also available for free on Kindle Unlimited, so get it before that opportunity goes away. I’m just gonna say it, this one is probably more for you if you liked Divergent because of the love story between Tris and Four because this one has a lot of focus on the boy stuff. Cassie goes in to be matched and Xander’s face pops up on the screen like she knew it would but then there’s a quick flash and she sees Ky’s face instead. They say it’s a glitch but it’s hard to forget the split second flash. So what’s a girl to do? What books like Divergent should I add to this list? The Mara Dyer series are my absolute favourite books. I am constantly searching for similar books!! Great list and thank you. I’d like to recommend Glitch Series (3 books) by Heather Anastasiu. Glitch (Glitch, #1), Override (Glitch, #2), Shutdown (Glitch, #3). I read all 3 books in a few days and completely sucked me in. Romance. Suspense. Sci-fi. What’s not to love? I now have to read uglies!! My math teacher recomended it to me and I didn’t give it much thought, but now I just have to!! Unwind is also a very good book if you like sci-fi. I definitively have to recommend this series too. I have read it already and fell in love. I read all of them in about a weeks time. I would also like to recommend Beautiful Disaster. It’s for you if you like a lot of romance. I enjoyed Beautiful Disaster as well! Hey, Britny! Amazing list! Love it. I can not begin to express how much I LOVED this book. It is so beautifully written and just completely enthralling. It’s been a long time since I’ve been so emotionally touched by a book. Lauren Oliver’s writing is more poetic then prose and it absolutely took my breath away! As far as dystopian world building it isn’t the best, but this is so well written it didn’t really matter. This one left me wanting more and I can not wait to continue on to book 2 and 3. Sarah Drew’s performance (audiobook listened) is brilliant and complete perfection. Ooh I didn’t realize Sarah Drew reads the audiobook, I adore her! Another relatable series would be Red queen. Recently read it and it became my favourite. Its has 4 books. 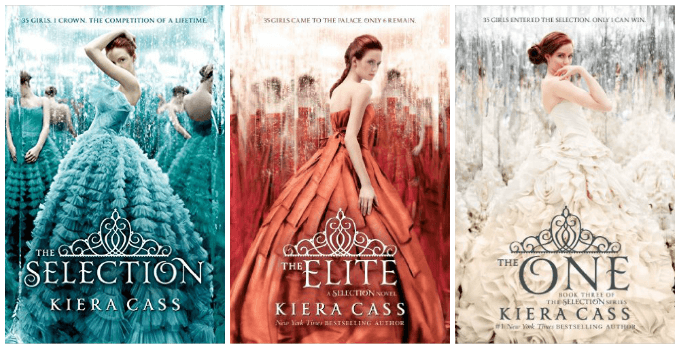 If you loved these books you need to read the selection series. It is so good. Once I had read the first one I went on to the next. Each better than the one before it. If you read it tell me. I want to know your reaction to it. 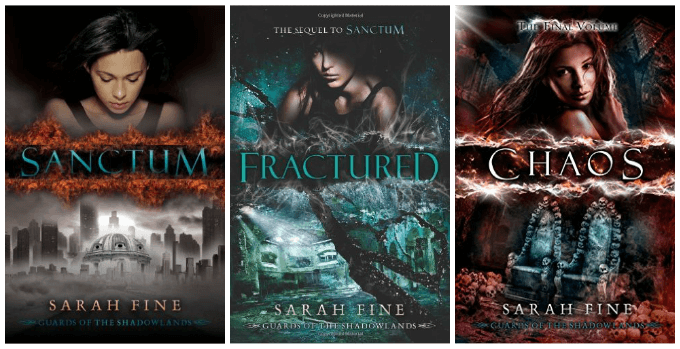 I loved The Selection series – it’s actually in this list with my reaction and a link to my review of the first book! Umm.. can u tell me how to use goodread? I mean cant we read books from them rather than only buying? I’m not familiar with that part of GoodReads if it’s a thing, I’ve only ever used it to review/rate books and get book recommendations. Sorry!